As previously mentioned, all foreign riders had to apply and collect entry visas at the Hungarian Embassy in Vienna before they were permitted to cross the border into Hungary. This was accomplished after some delay however on arrival in Budapest we soon found ourselves enjoying the luxury of staying at a Grand Hotel the race organisers had kindly provided for us in the middle of this historic city. What a change after camping and living mainly in the Thames for the past 6 weeks! The park situated approximately half a mile from the city centre was closed to the movement of public transport for the duration of practice and racing. The circuit was almost circular and lined on both sides with narrow footpaths not more than 2 meters wide bordered by continuous rows of plain, or maple, trees. The only other notable feature was the high crown of the road requiring riders to always stay on the left hand side of the track, running in an anticlockwise direction and a large roundabout skirting ‘Heroes Square’ with tram lines going off in all directions, which the riders had to navigate with some care! Having parked and off loaded the 256cc Parilla for scrutineering (my only entry for this meeting) nearly 2 hours passed before Vernon showed any interest in us or our Parillas, eventually he wondered over and after 5 or 10 minutes looking at the bikes without saying a word he eventually gave us the benefit of his thoughts “pretty, I hope they lasts” and that was it! Things did improve in our communications when just before going out for the first 350cc practice session, Vernon turned to me and advised “stay back and let the locals try climbing the trees before you go out ” how right he was, the session had to be suspended on at least 2 occasions, whilst the race marshals cleared the track of fallen riders and their machines! The following morning we came to the line for the 350cc race, this turned out to be a pretty uneventful race for me after all the heroics of the local riders on the previous day, of course there were less of them now! 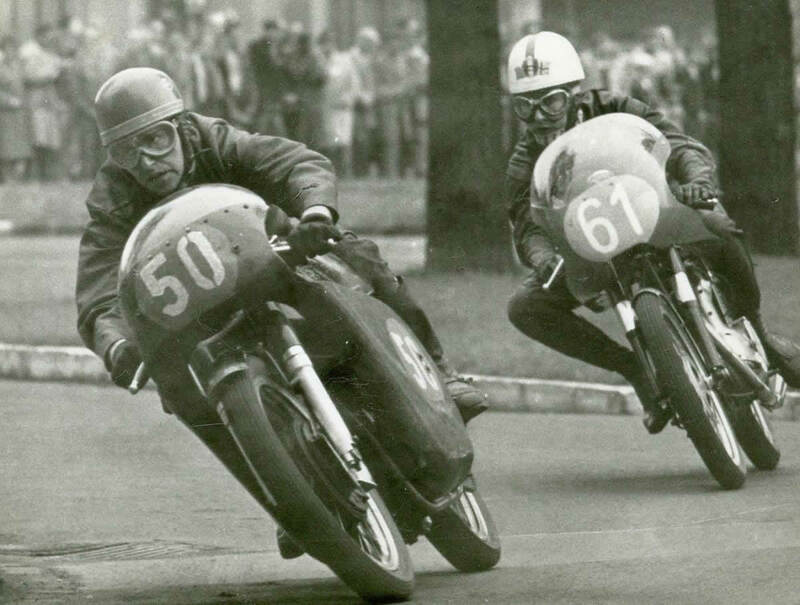 I was pleased with my10th place finish against 350cc machines and happy to see Vernon win the race ahead of Laszlo Czerkuti & Ron Robinson – all on Manx Nortons. Competing in Budapest gave me my first opportunity to see another side of life for Continental Circus ‘privateers’ in that when racing behind the Iron Curtain some riders became ‘traders’ This came about as a result of the riders only receiving, at best, half their start money in hard currency and the remainder plus any prize money in the local (non tradable) currency. The experienced riders/traders would use their local currency to buy Leica cameras, crystal and even hand engraved quality shotguns which they would then exchange for hard currency in Vienna on their way back from behind the Iron Curtain. With nearly 2 weeks to go before our next race meeting at Skofja Loka, and with a little extra prize money for my 10th place, we decided to stay on in Budapest for another 2 days. The organising motorcycle club kindly provided us with an interpreter and guide who enthusiastically showed us the sights of this historic and most interesting city. Not so attractive was the inclusion on the tour of a Russian T 30 Tank, half submerged in the river Danube, where our guide claimed the Hungarians had pushed it during their uprising against the Russians in 1956, only 8 years earlier, how times change, mostly for the better thank goodness. On our last day in Budapest we passed a hardware store exhibiting a large range of galvanised steel tanks. Still having a relatively full pocket of local currency we decided to purchase 8 tanks, each of 6 gallon capacity, with the intention of filling these with petrol – on sale locally at a quarter of the price in the West. When crossing the Hungarian/Austrian border on our way out Vic and I noticed a long line of traffic being held up by a South African rider who had 4 new tyres strapped to the top of his van which the Austrian Customs officials were taking some interest in. Our colleague was claiming these tyres were for his personal use; the problem was that they were clearly very large agricultural tractor tyres! As I was soon to discover, there was nothing some of these guys would not do to make a few shillings, just so they could keep on racing.